When you get a phone call, the display of your mobile phone shows that phone number of the caller and you trace the phone number location easily using this phone number. If its a mobile number, then you can find its location using the mobile number tracer. If its a land line number, you can find the approximate location of this phone number by finding the city from the STD code. So its possible to find the location of caller using the apps. But wouldn’t it be best if your phone screen displays the location of the caller directly? Now its possible using this android app called Shaplus. Shaplus is a free android app that determines the approximate location of the caller with the help of its phone number and displays the location on your phone’s display screen while the phone is ringing. 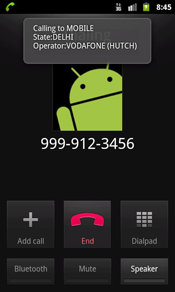 This apps works both for outgoing calls and incoming phone calls. Once you install this app, it will also let you perform offline reverse telephone number look up. To find the location of any phone number, just enter the phone number in it and it will show you the location and operator of the same. Note that this is not real time location tracing of the phone number. It simply tells you the operator and operator circle of the mobile number. This info is already embedded in a mobile phone number. For land line numbers, it determines the location just by showing you the city for the STD code.